There’s a reason why every parent says their child grows up too fast. Before they know it, their 6-month old infant who was just starting to crawl is suddenly packing their things and moving away to college. A child’s experiences during the early years of their development are critical and can make lasting impressions. Parents want to be involved every step of the way, but many work full-time and struggle to balance work commitments and family time. 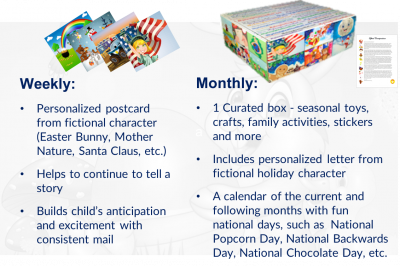 As working parents with two children, My Imagination Mail co-founders Holly and Mike Roper recognized the need to have meaningful playtimes and interactions so their children could grow up fondly reminiscing “remember when we did…” Which is why they created My Imagination Mail: a subscription-based service geared towards young children and their families that delivers monthly seasonal items and weekly postcards throughout the whole year. Curated boxes are delivered once a month and contain seasonal toys, crafts, stickers, family activities and more that parents can use to create lasting experiences with their children. My Imagination Mail was created to be a fun, engaging, and magical experience for each child and their families. Parents often do not have the time to coordinate activities or are not sure where to begin. This imaginative service takes the guesswork out of planning fun interactions with their children and delivers it directly to their doorstep. These creative boxes are also a wonderful gift alternative for a child. If a grandparent or other family member is unsure what the child would like or they are given instructions by the parents to gift something small, My Imagination Mail makes it easy to register and select the desired package. My Imagination Mail is bringing a unique experience for each child to promote healthy, happy and engaging family time. Let the magical memories begin …. before your child grows up!